The recipes in Lane Morgan’s book “Winter Harvest” inspire a season’s worth of fresh meals. The winter garden of goodies like escarole (above) can inspire in the kitchen, if you have the right recipes. Lane Morgan’s book Winter Harvest will get you cooking. Winter gardens in the Pacific Northwest produce more than just potatoes, squash, kale and cabbage. Open your eyes (at least in the right garden or farmers’ market) and you’ll find cardoons, chicory, Florence fennel, and scorzonera – not to mention rampion, raab, good king henry and hamburg parsley. The Portland Farmers’ Market is open this winter at Shemanski Park (South Park Blocks between SW Main and SW Salmon) through February 25, on Saturdays from 10 a.m. to 2 p.m. I haven’t checked it out yet this new year, but I’m especially eager to now that I’ve perused Lane Morgan’s fabulous Winter Harvest: How to select and prepare fresh seasonal produce all winter long. Winter Harvest is a guide to winter vegetables – from the usual suspects to the not so well known mentioned above – that the Bellingham, WA-based author and teacher first published 20 years ago, before “locavore” was even a word. Now she’s updated the book for its 20-year birthday, and its message and methods are all the more welcome. I’ll have to check out the winter market to see if I can score some gobo (a root “full and rich, with a bittersweet edge”), orach (spinach-like member of the goosefoot family), or hardy kiwi. For now, there are plenty of simple recipes for commonly found winter goodies like cauliflower, Brussels sprouts and kale. 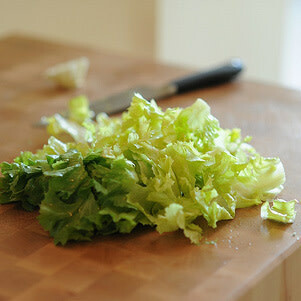 Here is one to start with, featuring escarole (a “broad-leaved variety of chicory”). Recipe from Winter Harvest by Lane Morgan; New Society Publishers, 2010.